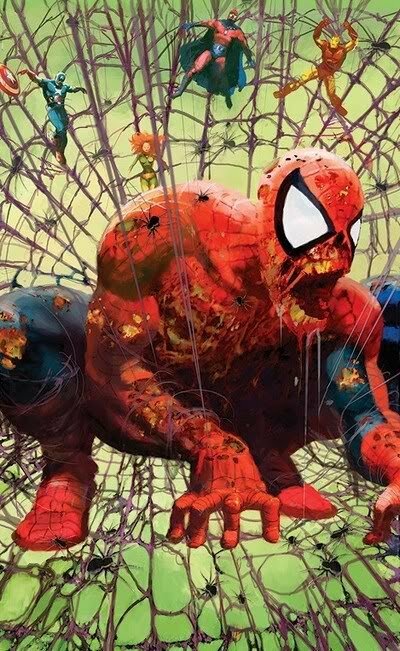 As an extra added bonus to our Spider-Man Week, I thought I'd take off from Olivier Agustin's comment on the list of the top 5 most important Spider-Man artists of all time! 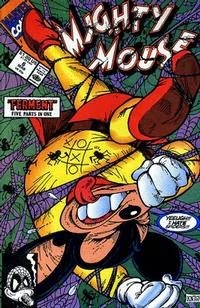 But overlooked, I think, is the fact that it's most likely the most homaged cover of the modern era! 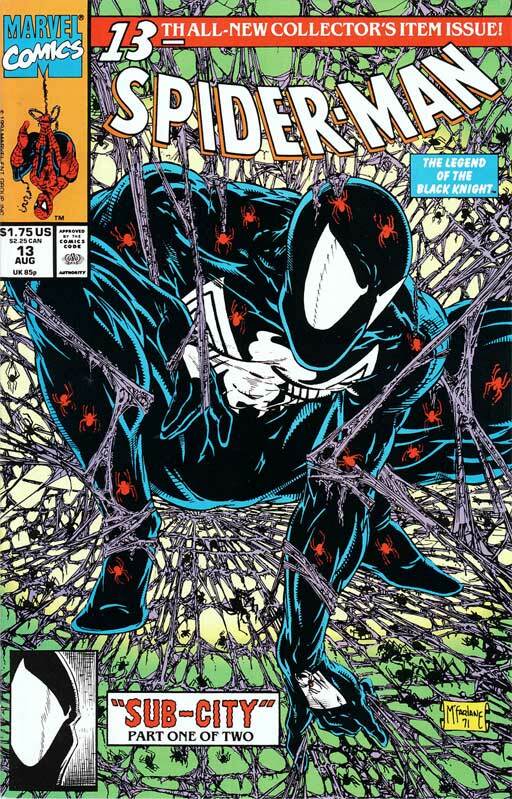 In fact, McFarlane himself keeps going back to this cover. 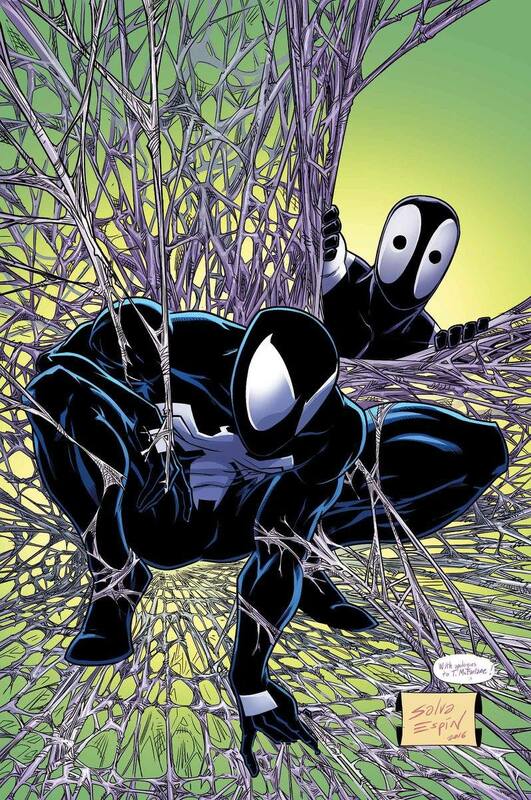 It's a cover that's so recognizably Spider-Man's, that any similar pose is considered a tribute. Let's look at some of them! The earliest "tribute" to Spider-Man #1, if homaging yourself can be counted as a tribute, is Spider-Man #13, which gave us the same cover with Spider-Man's black costume. To this day, there's still debate about which costume is better! (Red and dark blue with armpit webs for me, folks.) In this issue, Spider-Man has to go infiltrate a sub-urban (as in, in the sewers) community led by Morbius, so there's actually a storyline reason as to why he wears the black suit. 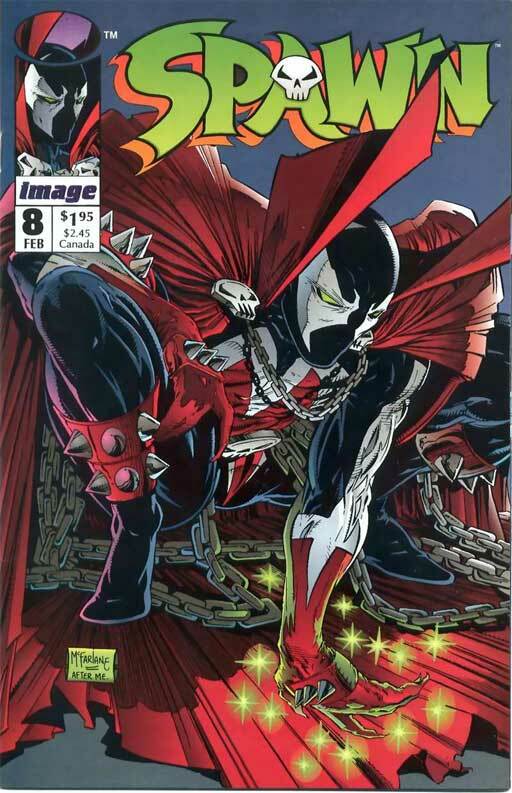 Then came Spawn #8, which was written by Alan Moore! 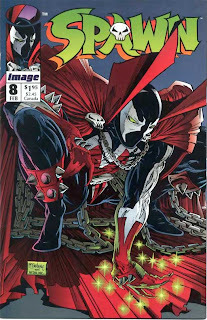 This comic doesn't star Spawn at all, but features Billy Kincaid, a serial killer from the earlier issues of Spawn, making his way through what would be the Spawn-verse's Hell. 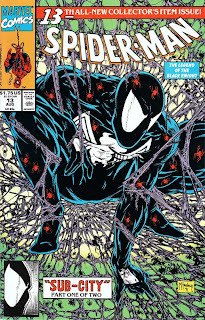 Aside from this being my introduction to Alan Moore, this issue was nothing special (though still better-written than anything McFarlane himself was writing). We'll skip the third one and go to 1996, when the Spider-Clone saga was in full effect. 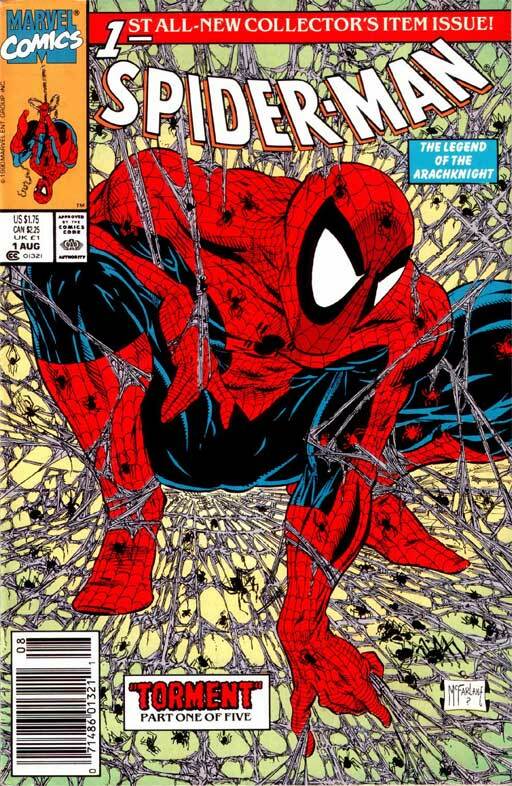 At the time, Marvel released the Spider-Man annuals as enlarged "specials" that were flipbooks - meaning you read the main story (in this case, "Planet of the Symbiotes") and then turned the book upside-down and read from the back cover for the backup. 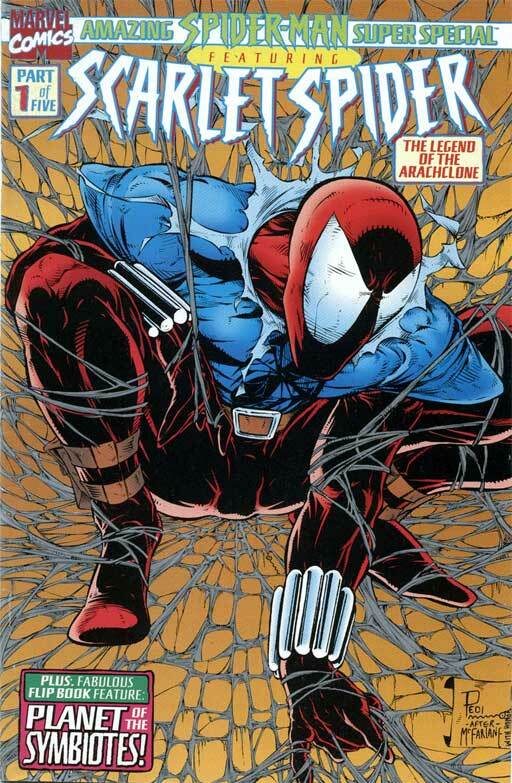 In this case, the backup was a solo tale of the Scarlet Spider. While the story was drawn by Phil Gosier, this cover was drawn by Pedram Shohadai. Storywise, the less said about this story, the better. Most recently, for Marvel Zombies, Arthur Suydam paid tribute to the cover. Other Spider-Man covers homaged were Amazing Fantasy #15 and the annual in which Spider-Man marries Mary Jane Watson, so that should give an indication of the iconic stature of this particular cover. 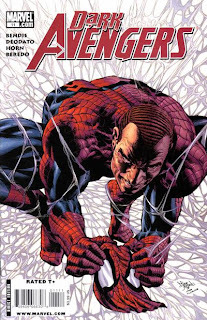 More recently, Dark Avengers #11 had Mike Deodato drawing Norman Osborn in the spider-suit. But the interesting thing is GI Joe #61, or GI Joe Special #1! You see, when GI Joe #61 came out back in 1987, Toddie Mack wasn't TODD McFARLANE just yet; he was just a fill-in artist substituting for the late, great Marshall Rogers. For whatever reason, his issue didn't meet editorial standards, even though he had completed the work, so Marshall Rogers was brought in to deliver the goods. 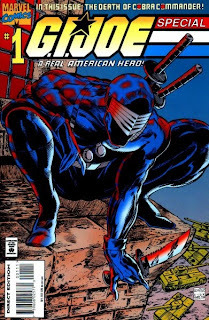 But then, Todd McFarlane became a superstar, well on his way to becoming who is quite possibly the richest man in comics, so in 1994, two months after GI Joe was canceled, they released GI Joe Special #1, which had GI Joe #61's story as drawn by Todd McFarlane! I encourage you to go to Comic Book Legends Revealed and check out the side-by-side comparison of Todd McFarlane's and Marshall Rogers' work! My opinion? Todd's certainly had more power, while Marshall Rogers conveyed the story more clearly and efficiently. Which one is better is purely subjective! 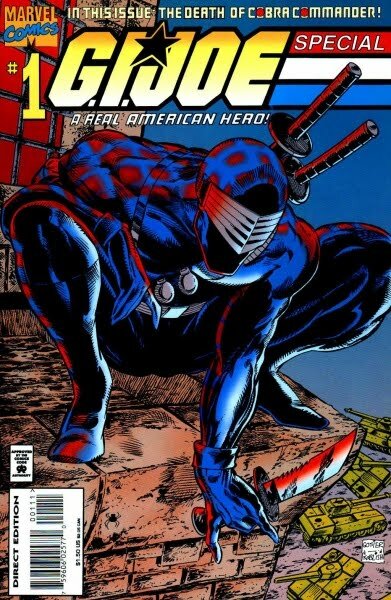 Anyway, for a cover, they decided to get Phil Gosier (which makes me wonder why they didn't just have him do the Scarlet Spider cover two years later, since he drew the story anyway) to pay tribute to Todd McFarlane, and what better way to do it than by putting the most popular GI Joe, Snake Eyes, in the pose arguably most associated with Todd McFarlane (even though, oddly enough, Snake Eyes doesn't show up in the story at all)? 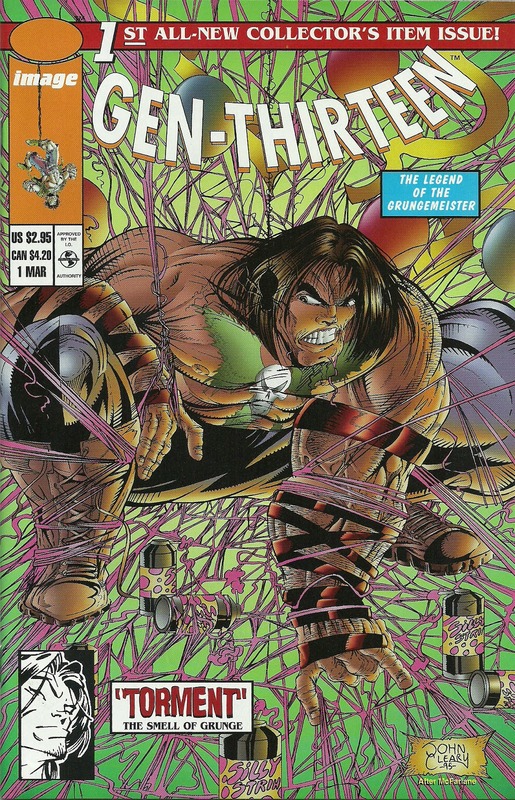 Here's a Gen13 cover by John Cleary. Here's Deadpool: Back in Black #5 by Salva Espin. You forgot the "Boof" Gen 13 cover by John Cleary.